Last year, the Cubs played the Cardinals on September 23-25, and the story was somewhat different. The Cubs had already clinched the NL Central and were simply playing out the season to see how many wins they could rack up (103). While they might prefer to be back in that position this year if they had the choice, the 2017 Cubs have already given us an extra month or so meaningful (and largely excellent) baseball, and now it looks like it will culminate in St. Louis this week. In that spirit, Wrigleyville is busting out a series preview for the first time this year. Woof indeed. The Cubs magic number for clinching the NL Central is 2 with respect to both the Cardinals and Brewers, meaning that they are very, very likely to clinch in St. Louis over the next few days. They can knock the Cardinals out of the NL Central race as early as Monday, and they can knock out the Brewers (and clinch it for themselves) as early as Tuesday. Any one win over the four-game series will knock the Cardinals out, and any two wins would be guaranteed to win the Cubs the division. The stakes are much higher for the Cardinals, who sit two games back of the Rockies and half a game back of the Brewers for the last Wild Card spot. Realistically, they have likely given up on the Central, and they would likely be happy with taking three of four from the Cubs and hoping the Rockies and Brewers lose elsewhere. Both the Brewers and Cardinals are likely eyeing next weekend’s series against each other. Each will be looking to put themselves within striking distance of the wilting Colorado Rockies when they square off in St. Louis starting on Friday. Regardless, since the Cubs look unlikely to clinch at Wrigley, the ability to clinch in St. Louis is a very nice consolation prize. After that, they’ll head home to Wrigley for three with the Reds, and then almost certainly to Washington to square off with the Nationals in the NLDS. This will be the Cubs’ first chance to knock out the Cardinals, and it will also be interesting in that we’ll be watching a great but struggling veteran against the newest long-term addition to the Cardinals’ rotation. Lester has struggled since going on the DL—he gave up seven runs in his last outing in Tampa—and he’s no longer a shoo-in for a top spot in the postseason rotation. This will be his penultimate addition for that spot, and it will be interesting to see if his velocity ticks back up after being lower than average over his past several starts. Weaver has only 52 and 2/3 innings pitched this season, but he’s been stellar the whole way through, and he looks like he’ll stick in St. Louis for a long time (of course). This will only be his second time facing the Cubs. They got to him in his debut for two runs in just four laborious innings of work. Arrieta looked good in his return from injury in Milwaukee, and he’ll look to carry that form into this matchup with St. Louis’s ace. This seems like the day the Cubs are most likely to clinch the Central. The Cubs will need Arrieta on top of his game for the postseason, and this could potentially be his final test, depending on how much the Cubs want to save him up for a matchup with the Nationals. Martinez holds just a 4.55 ERA lifetime against the Cubs—they have hit him better than any other team (with a minimum of 5 appearances) except the Rockies. Given his frequent struggles, this could potentially be John Lackey’s last start with the Cubs. His contract is up after the year, and it’s hard to see the Cubs finding a way to fit him into the postseason rotation, a la Jason Hammel last year. I wouldn’t put it past them to figure out a way to get him on the roster though, as they seem enamored with his veteran presence. If Michael Wacha doesn’t strike fear into your heart, I won’t blame you. Despite being a good pitcher for several years now, the Cubs have absolutely owned him. He holds a 6.32 ERA in 13 career starts against the Cubs—by far the worst among teams he has started even three times against. Hendricks has looked like an ace of late, and this will be his final tune-up for what could be an early-NLDS start against the Nationals. He has a 2.34 ERA in 73 innings since returning from the DL on July 24, which basically mirrors last year’s near-Cy Young performance. Lynn’s contract expires after this season, and if the Cardinals don’t make the playoffs, this could very well be his last start for St. Louis. – Maddon seems reluctant to go away from Jason Heyward, despite his offensive struggles. Keep an eye on whether he gets in the lineup for the pre-clinch games, or whether he is used more as a defensive replacement later on in the games. Also keep an eye on Albert Almora’s performance, as his bat seems the most likely to directly take away from Heyward’s playing time. – Wade Davis will likely get a lot of innings in the postseason, and he is very likely to go more than one inning where needed. This mirrors the usage of Aroldis Chapman in last year’s playoffs. Now that the division is all but in hand, watch for Maddon to scale back Davis’s use from the current very-heavy level that it has been on over the last two weeks or so. – The bullpen ahead of Davis is still very much in flux depending on who is perceived as being hot. Pedro Strop, Carl Edwards Jr., Mike Montgomery, and Brian Duensing seem to be the go-to guys, but there is still room for establishing a spot on the playoff roster with a week or so to go. As Davis’s use is scaled back, watch for who gets to pick up those extra innings. I’m particularly curious about how Justin Wilson is used, since he was acquired as a high-leverage guy who hasn’t lived up to those expectations. If he gets hot over the last week, though, I wouldn’t be surprised to see him on the mound for an eighth inning in Washington. Hector Rondon will also be given a chance to get going. 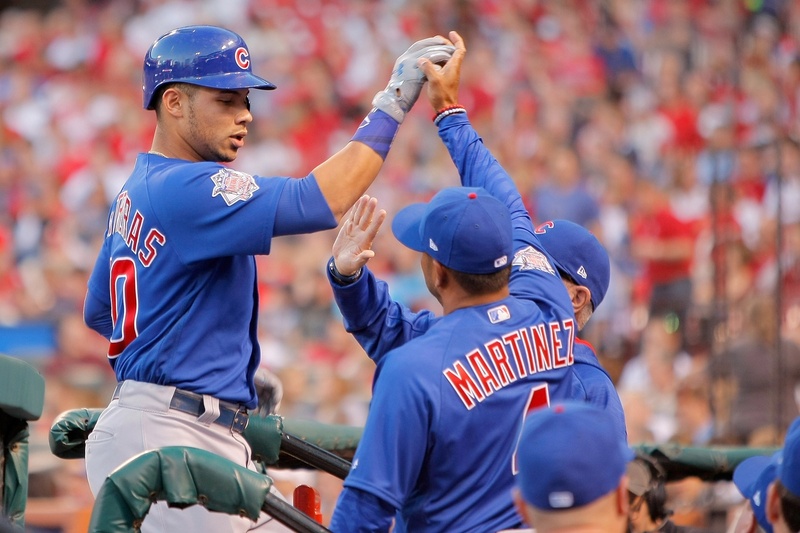 – Finally, watch for the Cubs to clinch the NL Central for the second straight year for the first time in nine years. It’s become very unusual for a World Series winner to repeat as even a division winner (the 2009 Phillies were the last team to do so), so even as 2017 has felt uninspired at times, it’s been a huge success. Also, keep an eye on the Cardinals faces as the Cubs clinch, because, hey, there’s nothing like a little September schadenfreude to get you ready for October.